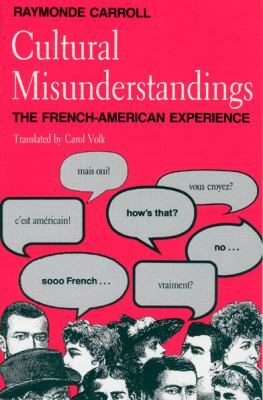 Raymonde Carroll presents an intriguing and thoughtful analysis of the many ways French and Americans--and indeed any members of different cultures--can misinterpret each other, even when ostensibly speaking the same language. Cultural misunderstandings, Carroll points out, can arise even where we least expect them--in our closest relationships. The revealing vignettes that Carroll relates, and her perceptive comments, bring to light some fundamental differences in French and American presuppositions about love, friendship, and raising children, as well as such everyday activities as using the telephone or asking for information.Carroll, Raymonde is the author of 'Cultural Misunderstandings The French-American Experience', published 1990 under ISBN 9780226094984 and ISBN 0226094987. Loading marketplace prices 69 copies from $0.30 How does the rental process work?